Multilateralism has been the prevalent method to solve international issues since the end of the Second World War. The idea is that the inclusion of more than two parties to solve international issues ensures more legitimacy and long –term efficiency. Institutions such as the United Nations, the World Trade Organization (WTO) or the International Monetary Fund (IMF) are the renowned multilateral platforms of our time. In the past years, we have witnessed the resurgence and strengthening of bilateral and regional relations (see table below). In other words, the trend is to use a platform with a few selected participants rather than a multitude. The creation and the use of regional institutions, regional agreements and bilateral agreements are only the product of their geopolitical environment: the resurgence of bilateralism and regionalism stems from the incapacity of large multilateral institutions to create adequate solutions for the parties concerned. Multilateralism aimed at providing a platform for states with less political and economic influence to express their views; however, when facing stronger economies, it is easier to negotiate terms of an agreement as a group with a converging agenda such as the United Nations Regional Groups of Member States. Logic would have that this phenomenon is due to the fact that dealing with regional issues is just easier on a regional level. Indeed, bilateralism and regionalism can be fairer and better platforms to solve issues. The purpose of multilateral institutions is to integrate more parties, it appears that smaller states can feel left out amongst bigger players and larger states slowed down by the myriad of negotiations. The question is: Does the renaissance of a regional and bilateral relationships signal the beginning of the end of a multilateral world? The most recent sign of a rusted multilateral system is the failure of the WTO Doha Round in December 2013. India´s refusal to adopt the legal text put a halt to the negotiations started in 2001 (the WTO decision-making system requires the consent of all members; consensus exists only when no member formally objects to the decision). For a decade, the WTO has tried unsuccessfully to reach a consensus between its members on major agricultural and other trade-related issues. These issues are pivotal to the economic relations between developing and developed countries (agricultural subsidies­; trade facilitation procedures and non-tariff barriers). The impasse of the Doha Round can righteously transform into a catalyst for negotiations on a regional or bilateral level for members desperately in need of an alternative. Somehow, that alternative could be the Transatlantic Trade and Investment Partnership (TTIP) for the EU and the US. 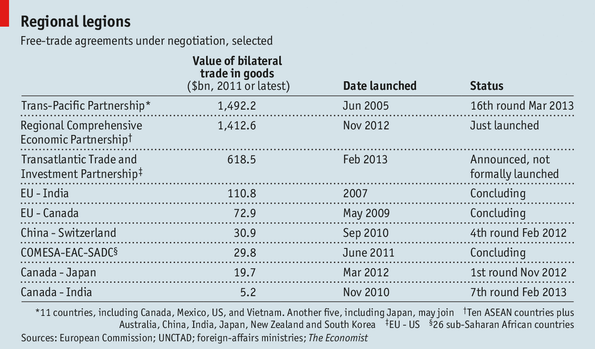 The EU and the US are currently the largest trade agreement so far considering the economic weight of its participants. The TTIP agreement seems very promising for the regulatory coherence between the EU and the US. In terms of international trade, the EU and the US account for 60% of global trade, 33% of world trade in goods and 42% of world trade in services. It is also worth noting that the US and the EU are the most recurrent parties of the WTO dispute resolution system and that they also carry significant weight in influencing the regulation of trade between the members of the WTO. The regulatory negotiations and the coherence to be achieved by the EU and the US will undoubtedly have a large impact on the way trade is made with the EU and with the rest of the world. Thus, the question arises as to whether the WTO will remain relevant as the platform for international trade negotiation and the development of trade regulations in the future. The international financial sector has also witnessed the obsolescence of multilateralism. The multilateral system has also been unable to provide an international solution on the very political and legal controversy that is the manipulation of currency values in order to gain unfair competitive advantages over a foreign competitor. The IMF, which has a mandate on currency surveillance, can identify undervalued currencies threatening the stability of the financial system but does not have an efficient enforcement mechanism. In 2009, Brazilian President Dilma Rousseff denounced the activities of certain central banks in Europe and in the US which were affecting the value of the Brazilian Real in a statement before the United Nations General Assembly. However, actions are being taken on a smaller scale despite the presence of platforms such as the WTO or the IMF. Following the BRICS Summit in 2012, a communiqué was released by the BRICS denunciating currency manipulations by some developed states. The US and China have also recently engaged in a “Strategic Economic Dialogue” to tackle the issue of currency manipulation which can ultimately has an impact on the international financial and trade system. Only time will tell us whether this will result in a multilateral or bilateral/regional solutions. The lesson is that, the increased use of regionalism and bilateralism in international affairs reflects a multilateral system that is struggling to face a growing number of key states with diverging domestic interests. Nevertheless, extensive and protracted regionalism and bilateralism can draw the world further apart and jeopardize the achieved security and predictability of the international system.The current trend is the result of a divided world, regionalism clearly has the power to breathe new life into the pursuit of international solutions. The latest multilateral conference on climate change in Lima, Peru is a positive sign in this direction. The United Nations members reached a first agreement based on “common but differentiated responsibilities and respective capabilities, in light if different national circumstances”.